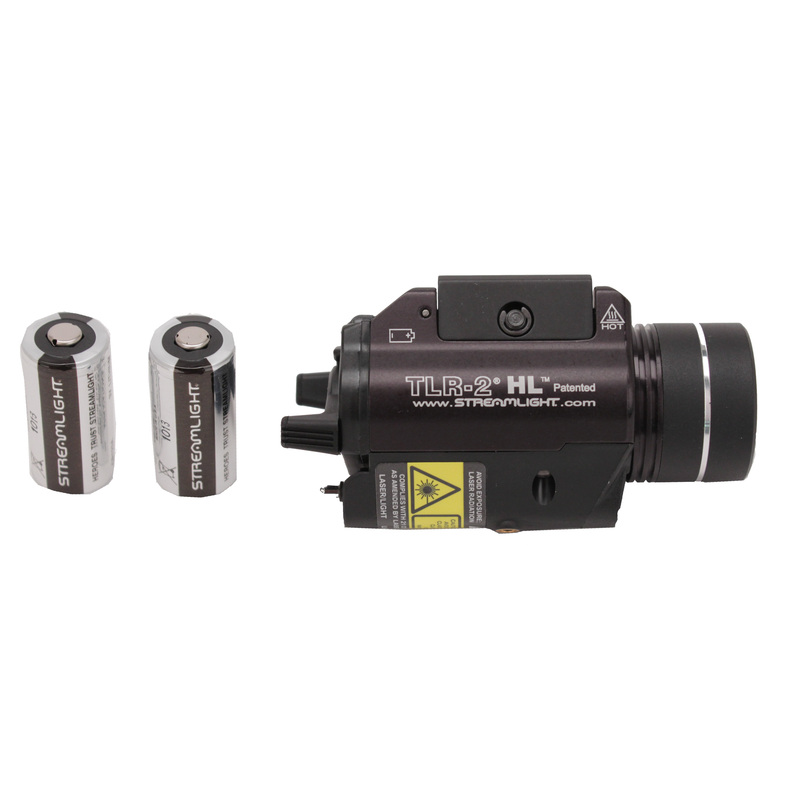 View cart “Streamlight TLR-7” has been added to your cart. The Streamlight TLR-2 HL Tactical Gun Mount Laser & Light provides a 800 lumen blast of light for maximum illumination while clearing a room or searching an alley, combined with an integrated red laser sight for longer-range targeting. The Streamlight TLR2 HL Gun Light/Laser has a wide beam pattern that can light up large areas, so you can identify who or what is nearby. This compact, powerful pistol light uses C4 LED technology that is impervious to shock and has a 50,000 hour life. The Streamlight TLR-2 HL Light w/ Laser Sight mounts quickly, easily, and with no tools, thanks to the integral rail grip clamp system that attaches/detaches without requiring you to put your hands in front of the gun's muzzle. This lightweight, compact, high-lumen Gun-Mounted Tactical Light provides up to 1.25 hours of continuous run time when in dual mode with the high power visible laser. The Streamlight TLR2-HL has a tethered battery door and latch mechanism that prevents battery door loss, while providing easy battery replacement. When enabled, the strobe function is activated by two or more momentary paddle hits. This combined weapon light and laser sight has a 6000 Series machined aircraft aluminum main body with black anodized finish; the laser sight is housed in a high impact, chemically resistant engineering polymer. Streamlight TLR-2 HL High Lumen Weapon Flashlight w/ Red Laser Sight. – 12,000 candela peak beam intensity and up to 630 lumens. – Mounts directly to handguns with Glock-style rails and to all MIL-STD-1913 (Picatinny) rails. – Operating temperature: -40°F to +120°F. – CASE MATERIAL: 6000 Series machined aircraft aluminum with black anodized finish on main body. – WEIGHT: 4.78 oz (135.5 grams) with batteries (included). – LENS: High temperature, shock mounted, impact resistant Boro Float glass. – LIGHT SOURCE: C4 LED technology, impervious to shock with a 50,000 hour lifetime. – ON/OFF: Ambidextrous momentary/steady On-Off switch. Three position Mode Selector switch (Laser only, LED Illumination only, both) Double tap of momentary paddle within 0.4 seconds activates strobe. Strobe can be disabled. – RUN TIME: 1.25 hours of run time to 10% output when using Laser/LED simultaneously. 45 hours of run time when using Laser only. Solid-state current regulation for consistent illumination level. – BATTERY: Two (2) 3 Volt CR123A lithium batteries, with a storage life of 10 years – included. 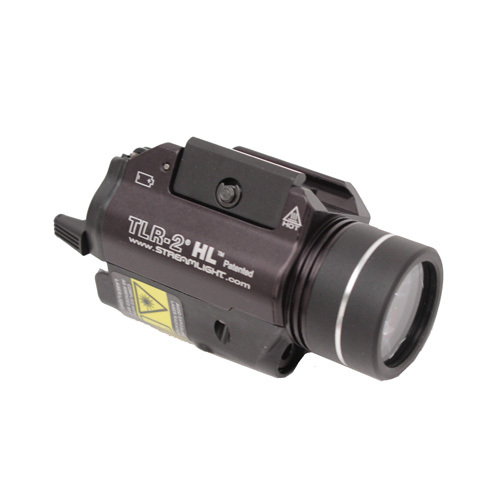 Be the first to review “Streamlight TLR-2 HL w/Laser,Rail Locating Keys.Bxed” Click here to cancel reply.